There they are, every Tuesday and Thursday -- two hundred minds seeking perspective on the means by which to access architecture: to think about it, look at it and analyze it, engage in discussions about it, and experience it. Student interests and capabilities are varied because in addition to being required for pre-architecture students, this is a university general studies course -- a threshold into the adventure of architecture! This paper addresses the content and methods of introducing architectural frames of reference to the beginning student of design in the challenging large lecture learning environment. Canon and skepticism. Five frames of reference are presented through which to consider the thought-full-ness of architecture: 1) Immutable Realities of Building (Ordering Landscapes, Enclosure and Object, Interior Space): 2) Historical Perspective: 3) The 'Great' Building; 4) The 'Great' Architect; and 5) Theories of Architecture. These are countered with the questions: Where is the architecture and presence of the 'other': e.g., the less powerful people, the vanquished, the less enduring construction, women and minority architects and theoreticians? Departing from the Western historical narrative and form based theories that anchor many introductory courses, in-depth case analyses from within each frame of reference blossom to situate buildings and places, their architects, their clients, their users, and their builders in a social-political-cultural context. Complex ideas are made accessible without reduction to the simplistic which often occurs in beginning courses. The intents are to initiate the construction of an architectural knowledge base and to develop a foundation for future independent inquiry. The active learning situations and tactics of small group discussions and team generated questions, an 'anonymous' question collection cap, in-class writing exercises based upon parallel readings, a self-study on-line slide resource 'Plato's Cave', and essay based exams break down the passive lecturer-recipient character that haunts most large introductory courses. 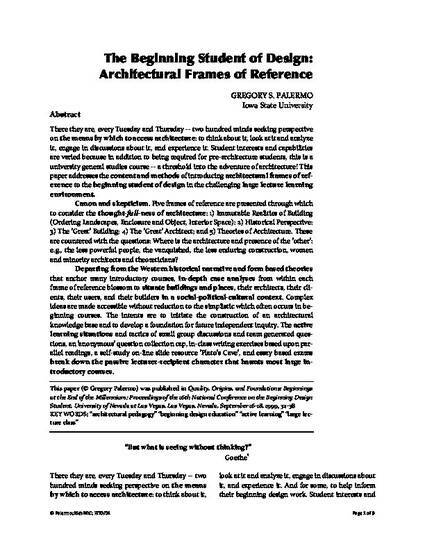 This is a proceedings from “The Beginning Student of Design: Architectural Frames of Reference” Gregory Palermo was published in Quality, Origins, and Foundations: Beginnings at the End of the Millennium: Proceedings of the 16th National Conference on the Beginning Design Student, University of Nevada at Las Vegas, Las Vegas, Nevada, September 16-18, 1999; 32-38. Posted with permission.